They've won 11 of their past 14 games to become playoff contenders in the Eastern Conference thanks to a wealth of talent. 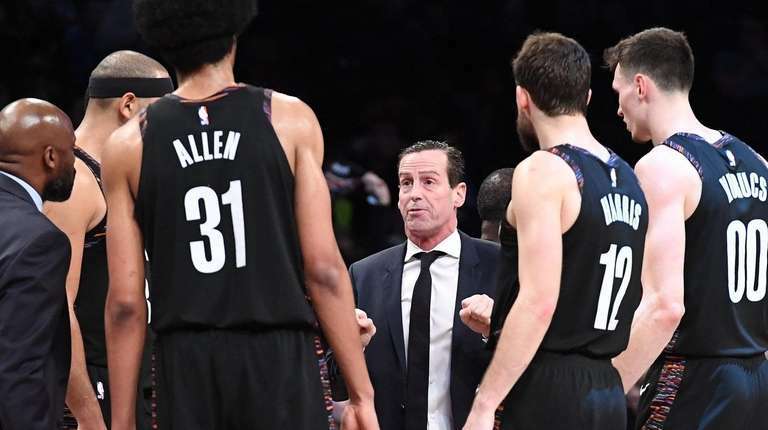 CHICAGO — Two years ago at this time, the Nets were caught in a miserable 1-27 midseason death spiral on their way to an NBA-worst 20-62 record in their first season under the leadership of general manager Sean Marks and coach Kenny Atkinson. There was a ray of hope last season when they reached the midpoint with 15 wins, but it fell apart in a 3-19 stretch before a 28-54 finish. But Year Three of the “Markinson” regime has a much brighter appearance that looks suspiciously like major progress. If the Nets defeat the Bulls Sunday afternoon at United Center, they would improve to 20-21 at the halfway mark, matching their win total for the 2016-17 season. They lost 10 of 12 games after Caris LeVert suffered a dislocated ankle that might keep him out until the All-Star break in February, but they held together with the benefit of great veteran leadership, found a way to close out games and now have won 11 of their past 14 games to become playoff contenders in the Eastern Conference. A year ago, Marks traded for D’Angelo Russell, the No. 2 overall pick from the 2015 draft, Allen Crabbe and veteran DeMarre Carroll. Last summer, he added seasoned veterans Ed Davis, Jared Dudley, Shabazz Napier and Treveon Graham. Nets 2017 first-round pick Jarrett Allen has developed exponentially, and when a slew of injuries to LeVert, Crabbe and Rondae Hollis-Jefferson opened playing time, second-round rookie Rodions Kurucs seized the opportunity to show what he could do. Atkinson credits Davis, Dudley and Carroll for setting a more physical tone and for showing younger players “the tricks of the trade” in terms of playing a smarter brand of basketball. Ask any opposing coach, and they will tell you the point guard play of Russell and then Dinwiddie off the bench is what makes the Nets a challenge to handle. Napier has joined that mix and Atkinson even had all three on the floor along with Harris at the end of their victory Friday in Memphis. The Nets already rewarded Dinwiddie with a three-year contract extension worth $34 million, and now face a decision on Russell, who can become a restricted free agent next summer and is a valued target for some teams at the Feb. 7 trade deadline. But given the signs of maturity and all-around improvement he is showing, the prudent thing might be to sign him. “Sometimes, when you’re that talented, you think it’s all about your scoring,” Carroll said of Russell. “But he can do so much for this team as far as assists and talking to guys. I feel like he’s kind of found his groove. Right along with the rest of the Nets.